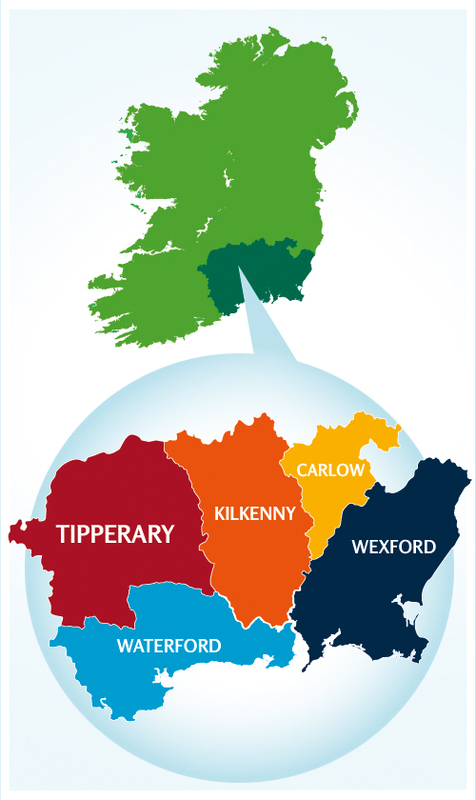 The southeast corner of Ireland is made up of counties Waterford, Wexford, Carlow, Tipperary and Kilkenny. Known as the ‘Sunny Southeast’ the area is filled with a very wide variety of attractions, cultural offerings and interesting things to do throughout the region. Down through the ages the Celts, Vikings, Anglo-Saxons and Normans have passed through the region leaving behind a landscape rich in historical remains. Countless castles, abbeys, fortresses and ancient settlements mark their passage, so for heritage and culture there is no better place to begin your explorations. The Southeast has something to do for everyone of all ages and tastes: historic monuments, colourful gardens, walking and cycling trails, abundant fishing locations and numerous golf courses. From the mountains to the beaches with a huge variety of exciting festivals, you certainly will be busy!